“Wow twins they must be hard work”. This is a common one. Not quite sure how to respond to this. Er yes but no. “Are they identical?” Fine when people don’t know the sexes, fair enough question. Rather worrying when asked by a healthcare professional who knew they were different sexes. “How big were they when they were born?” Cue shock when told they were 6lb and 7lb. “Were they born early?” Again shock when told they were born at 39 weeks. “You must have had to have a c-section”. Cue surprise at natural birth. These above three comments indicate how medicalised people think twin birth is (the whole birth thing is the subject of another post). Makes me sad in a way as there are reasons why twins have to be born via c-section but that doesn’t have to be the norm. “Ah the boy is the biggest”. Er no, he was smaller. Everyone always assumes the boy is bigger. “The only way to deal with twins is to put them into a routine”. I disagree, they find their own routines. Tried to Gina Ford my poor daughter, made me miserable and gave up after two days so not doing that with the babies. “You are feeding them yourself? !” Cue incredulity. Don’t want to get on a lactivist rant but although time consuming have found breastfeeding them easier than feeding my daughter. And enables me to get sleep – no really it does. “I don’t know how you do it”. This is another one I find hard to respond to. I guess it is hard to imagine what it is like having two babies when you have one. Just as I found it hard to imagine what it would be like to have a baby when I didn’t have one. But you just try to get on with it, any way you can. And when they are both smiling and looking at you adoringly it is wonderful. “I’m in awe of you”. I find this hard. I used to say “don’t be” but then I felt that not accepting the compliment was a bit rude. So now I just say “thanks” and try not to be shy or overwhelmed, even though I don’t feel particularly awesome. “Seeing you always makes me feel better about my own situation.” From other mothers! I kind of know what they mean but does make me feel a bit odd. “Are they yours?” Being barely 5ft3 and a slimmer build people don’t think I could have twins. ARGH! And two of my favourite ones…. “You are my hero” from another mother. Which was quite embarrassing but also rather lovely and touching. What is also incredibly touching is the number of people who say congratulations and how lucky we are. 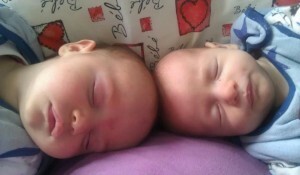 And despite those stressful times when they are both crying together I do feel lucky. But can people please not look at me with pity and say “it must be hard work”. Many things in life are hard work but that doesn’t mean you would change them.